Charlotte was the fifth largest TV market for ESPN/ABC during this year's Chase for the Sprint Cup, according to Nielsen Media Research. Nine of the 10 races were aired on ESPN (Charlotte's race in October was on ABC). Charlotte averaged a 6.5 rating for the 10 races, well above the national average of 2.5. For it's own race in October, the Charlotte market had the highest rating in the country - a 9.3. 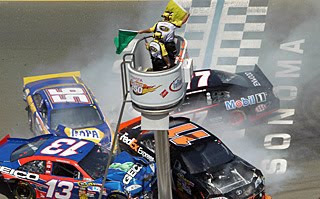 In the other nine races, Charlotte was third once, fourth twice, fifth twice, sixth once, seventh once, eighth once and the lowest was 12th for the Kansas race. Charlotte had a rating of 8.9 for the season finale from Homestead, the second-best of the 10 Chase races behind the Charlotte race.